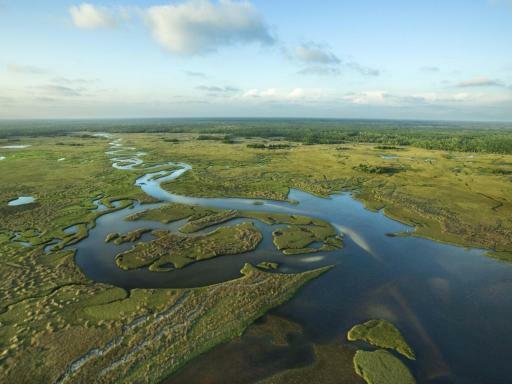 This thrilling wind-in-your-hair ride reaches speeds of up to 30 miles per hour across the “river of grass”. Afterwards get up close and personal at an Alligator and Snake handling show where you get the chance to learn, hold, feel, and get your pictures taken with these amazing animals. 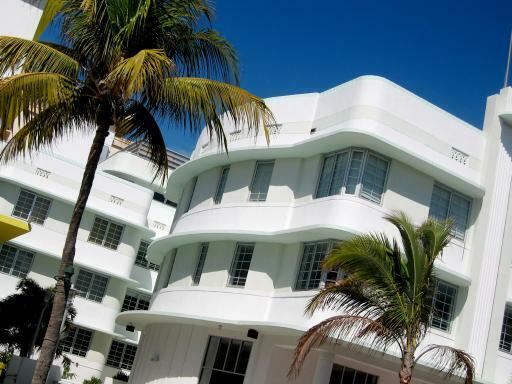 Continue to Miami with its Palm-fringed beaches and striking art deco architecture. Here you visit Miami’s Bayside shopping area with its designer shops, boutiques and eateries and wonderful views. 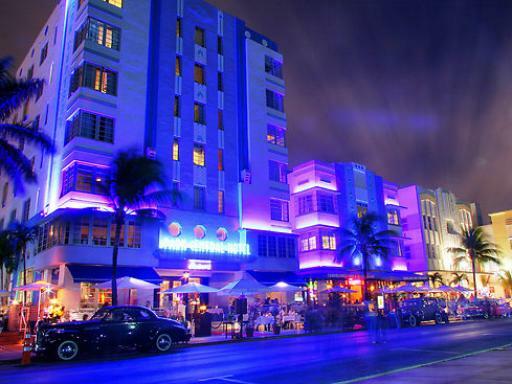 Your accommodation is provided right in the heart of the Art Deco District in Miami South Beach, just seconds away from restaurants, shops, museums, nightclubs and the beach itself. 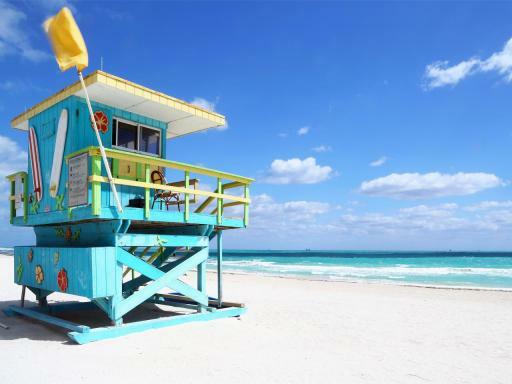 Once you check-in to your hotel, you have the rest of the day and evening free to explore the area at leisure and top up your tan on world famous South Beach. Day Two is the highlight of this fantastic excursion because its time for an amazing swim with dolphins! 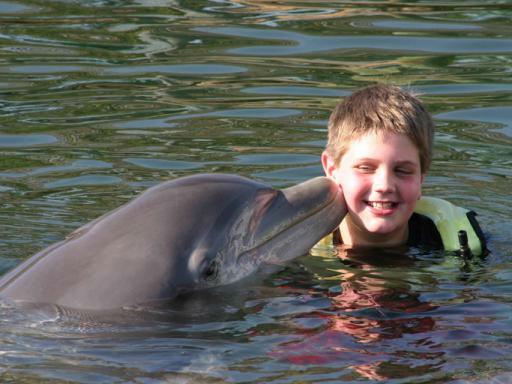 During your swim, you get to experience a whole host of behaviours including dorsal tow pulls, belly rubs, toe pushes, handshakes and the best of all a dolphin kiss! Remember that dolphin interaction is guaranteed! The dolphin swim programme lasts around 2 hours in total and includes 30 minutes in the water with the dolphins. 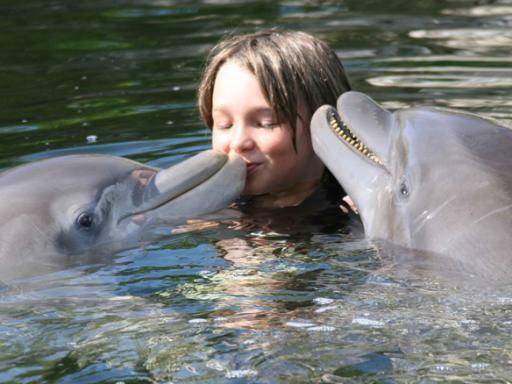 Those that select the non-Dolphin swim ticket are more than welcome to accompany family members to the dolphin facility to observe the experience. Alternatively, you can stay in South Beach for further exploration. 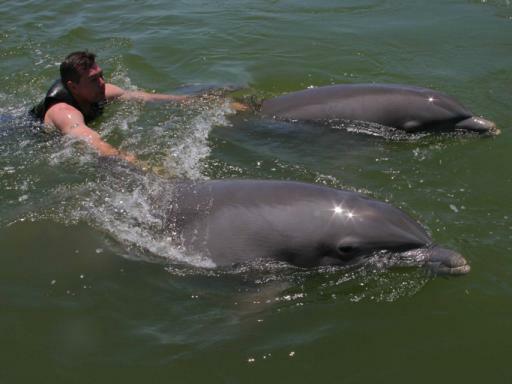 If you choose to swim with the dolphins you still have the afternoon in Miami to top off that golden Florida tan on South Beach before leaving for Orlando at about 4.00pm. 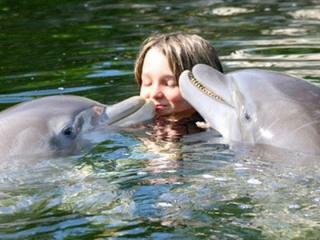 Customers swimming with dolphins will have to pay an additional $24 per person facility fee locally. This will be collected by the tour guide on the day of the tour. Swimmers must be 7 years old or above and children aged 7 to 12 years old doing the Dolphin Swim must be accompanied in the program by a participating parent or guardian. Non-swim tickets include all of the inclusions above except the Swim with Dolphins programme. The ticket does include entrance to the dolphin facility but those not wanting to visit the dolphin facility can enjoy free time in Miami Beach instead. Prices are based per person. Room Occupancies – rooms accommodate up to four persons. Parties of 4 persons or less will be accommodated in one room (please select ticket as appropriate). If there are more than 4 persons in your group, please select 5 to 8 Persons/2 Rooms option. Babys 0-2 years are free of charge but must sit on a parents’ lap. There is a small charge of $10-15 for a cot, which is payable to the hotel locally. Departs: Guests must make their own way to one of the pick-up points detailed above. Duration: 2 days. Travel time to Miami is approximately 4 hours each way. Start Times: Pick-ups commence at 6.00am on Wednesdays. 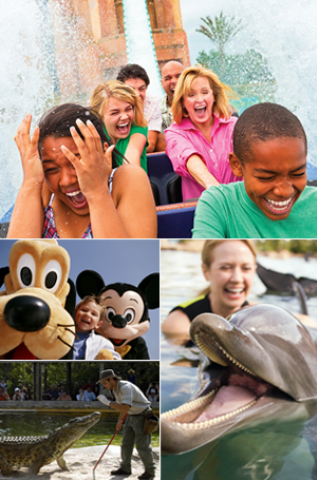 Try out the dozens of interactive workstations and computers located throughout SeaWorld. For example, kids can test their lungpower against a walrus in Wild Arctic, or see how a manatee grinds its food at Manatee Rescue. After being picked up at 6am we did not arrive in Miami south beach until 17.30.Everglades stop off was poor,as was the stop off at a small shopping mall in downtown Miami for 3 hours before arriving at our destination hotel.The aim here was to get you to purchase a boat tour.Miami south beach is a fantastic place with an amazing beach and shopping so cant understand why we didnt head straight there.Hotel I would rate 2/3 star but was ok for 1 night.The dolphin swim was a fantastic experience but you would need to decide if rest of the trip justified your hours swim.Would I recommend this to friends and family def. not. Firstly the good stuff.Madeline our tour guide was excellent and sorted a problem out with the dolphin swim booking. The dolphin swim was an amazing experience and well worth the money.Coach was freezing so pack warm clothing,Journey longer than expected and stop off at a small shopping centre on arrival at Miami was poor.Miami South beach was much better but we didnt arrive until 17.30 on the day of travel. Hotel was 2/3 star at best,glad it was only 1 night. 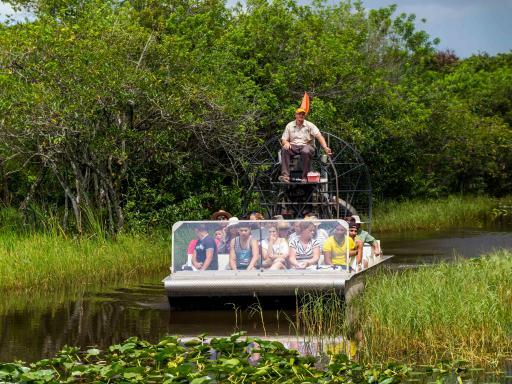 Everglades boat ride is 30 minutes in length. Would i recommend this trip to my family or friends sadly no. Excellent 2 day trip swimming with the dolphins was amazing tour guide was good the hotel we stayed in for one night was like a show box though!! Absolutely amazing experience would have been nice to have a more detailed itinerary prior to arriving at the pick up point. Pregnant women are unable to participate in the dolphin swim programs. On occasion, the tour itinerary may operate in reverse. The 2-Day Swim with Dolphins South Beach Tour runs from central location points in Orlando and you will need to make your own way to one of these departure points. This has been implemented to save you time sitting on a coach that calls at each hotel in Orlando – that’s a lot of hotels! The result is a much more fluid and punctual tour that will add to your enjoyment of the day. The pick-up locations are arranged so that you do not need to travel too far to your nearest point. You will need a Government-issued photo ID to check-in to your Miami hotel. Is a hotel pick-up included? The 2-Day Swim with Dolphins South Beach Tour runs from central location points in Orlando and you will need to make your own way to one of these departure point. This has been implemented to save you time sitting on a coach that calls at each hotel in Orlando – that’s a lot of hotels! The result is a much more fluid and punctual tour that will add to your enjoyment of the day. Where will my tour depart from? The pick-up locations are arranged so that you do not need to travel too far to your nearest point. The actual location will be given at the time of booking when you advise us of your hotel. In the event that you do not have your hotel information available at the time of booking, you will be advised of your pick-up point when you call to reconfirm your tour in resort. How long will I get with the dolphins? The 2-hour Swim with Dolphins programme includes a 45-minute orientation, time to get changed and the swim itself. There is no set 'in-water' time as each swim is unique but approximately 30 minutes is a good guideline. 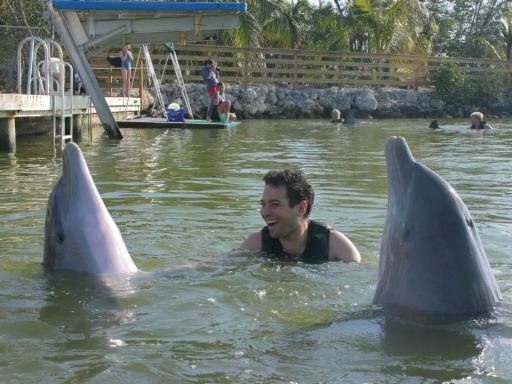 Guests will do 10-12 different behaviours with a dolphin.